…provide a fast, unique way to disinfect water without heat or chemicals. Using short-wave radiation from Hanovia germicidal ultraviolet lamps, STERITRON purifiers destroy all water-borne microorganisms, including bacteria and viruses. 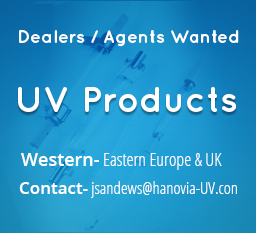 Hanovia germicidal lamps are found in a variety of applications, including personnel protection and prevention and prevention of cross infection in hospitals, laboratories and veterinary facilities and product contamination prevention in the food processing, pharmaceutical, bottling, electronics and semiconductor industries. Install purifier as close as possible to the location in which it is to be used. Connect inlet and outlet to water supply. Plug into grounded electrical outlet. Maintain by cleaning quartz sleeve with manual wiper once every month – more frequently where indicated by application conditions. Recommended lamp replacement: Once every 10,000 hours of operation (approximately 14 months of continuous operation). STERITRON water purifiers deliver optimum performance when equipped with the following specially designed HANOVIA lamps. These HANOVIA low-pressure type lamps produce the germicidal rays needed for water purification with maximum efficiency and the added benefit of low power requirements. These lamps eliminate the possibility of overheating and the need for special equipment to deal with overheating. Wattage is lamp watts only and does not include ballast loss. Maximum rated output at 254 nanometers. The dosage necessary to inactivate a microorganism is a product of time and intensity. 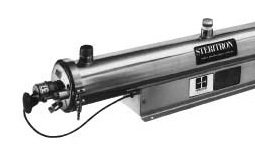 When used as directed, STERITRON purifiers will provide a dosage in excess of 30,000 microwatt seconds per square centimeter (**mu**Wsec/cm2). 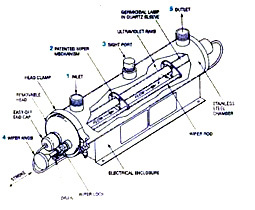 Ultraviolet energy at 254nm is required for complete destruction of some microorganisms. Two 31946.501s connected in series, 1 inlet and 1 outlet. Two 31946.601s connected in parallel, 2 inlets and 2 outlets. Three 31946.601s connected in parallel, 3 inlets and 3 outlets. Four 31946.601s connected in parallel, 4 inlets and 4 outlets. All inlets and outlets are male pipe threads. – All data shown above are for 118 volt 60 Hz. Units are also available for 220 volt 50 Hz and 12 volt DC operation.